If you would like a preview of what's covered in this class, click here to watch the first and last lessons of this course (free of charge), or scroll down for more information. Versions: Recorded with Access 2016. Most of the material should work with all versions of Access from 2007 on. Pre-Requisites: Access Expert Level 32 strongly recommended, as you should watch all of my classes in order. However, if you're skipping around, you should have at least completed the Beginner series and the first 3 or 4 levels of the Expert series where I start to cover functions. This class begins our exploration of Macros and Event Handling. We will start by discussing what macros are, their benefits, their limitations, and review the few macros we've already built into our class PC Resale database. Next we will learn how to build standalone macros that can be run from the database pane, in addition to embedded macros that can be placed in a button or form/report control. We will learn about the Macro Builder, Action Catalog, Beep command, MessageBox command, command arguments, OpenForm command, where conditions and filters, and the On Click event. We will build a button to open the Customer List Form. We will learn how to make smart macros. 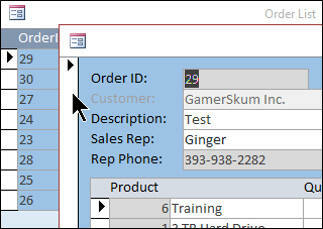 You will create an On Double Click Event which will allow you to double-click on a customer ID in the list form and open that customer's record directly. We'll do the same thing with contacts and orders. 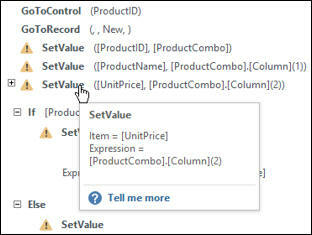 You will learn about If / Then / Else statements which allow your macros to make decisions. 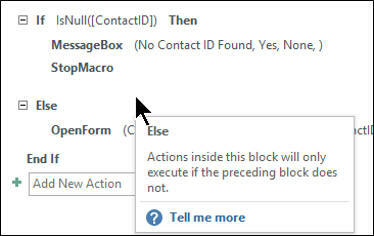 You'll learn the MessageBox and StopMacro commands. 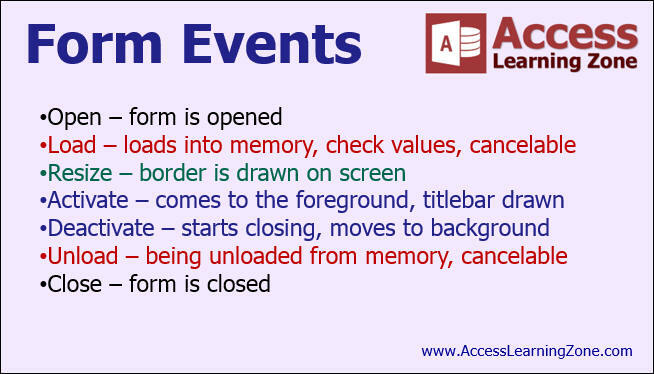 We will take some time to go over all of the different Form Events so that you know when to use which Event in each situation. There are a lot of them, and each has it's own use. We'll spend even more time on macro conditions. One of my pet peeves is opening a form, making some edits, and then returning to the list form and not seeing the changes update on the list form. We'll use the On Activate event to fix that problem. We'll also see how to use the CancelEvent command and the On No Data Event to stop a report from opening if it has no records. Good stuff. This is the 1st class in the Access Advanced series. If you're serious about building quality databases with Access, and you want to begin learning how to automate your database with Macros and Events, which is a good pre-cursor to VBA programming then don't miss out on this course. Of course, if you have any questions about whether or not this class is for you, please contact me. Richard on 9/20/2016: Access Advanced 1 begins our in-depth study of Macros and Event Programming. This is the 1st class in the Access Advanced series. If you're serious about building quality databases with Access, and you want to begin learning how to automate your database with Macros and Events, which is a good pre-cursor to VBA programming then don't miss out on this course. Of course, if you have any questions about whether or not this class is for you, please contact me. Contents include: - Benefits & Limitations of Macros - Standalone v Embedded Macros - Commands & Arguments - Macro Where Conditions - Smart Macros: If Then Statements - Open Specific Records with OpenForm - Form Open Events, On Activate - On Double Click Event - Canceling Macro Execution - Lots more Click here for more information on Access Advanced 1, including a course outline, sample videos, and more. 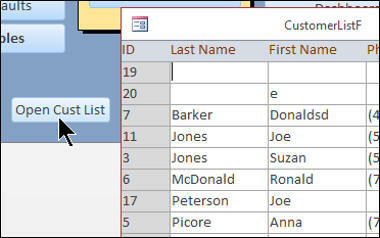 This course was recorded using Access 2016, but most of the topics covered are valid for all versions of Access from 2007 on. This class follows Expert Level 32. The next class in the series is Access Advanced 2. Dennis O on 9/21/2016: Send it, I want to pick it up where I left off. Note: I also sent a message to sales. You can subscribe to the list here. Sulaiman Jalloh on 10/26/2016: I really learning a from you and I need more. Thank for supporting us. There will be more Advanced lessons soon, unless you want to go to the old 2003 series. Ngala Elvis F. on 1/10/2017: I really enjoyed the lessons i watch on youtube microsoft access 2013 tutorial level 1 part 00 to 12. and i wish to continue.